Photo: CLP-H0072, Wisconsin Historical Society. Just to the east of the Gallistel House and north of the Frautschi entrance gate, property owner Reginald Jackson, Jr. (Doc Reg Jackson) built a most unusual structure. In addition to his interest in sailing, Reg was a sea plane pilot. 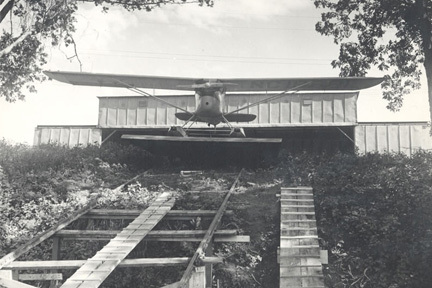 He had a unique hangar built here that used an inclined “marine railway” to haul the plane out of the water and up the steep bank.